Combining durability and high performance, the Mr. Bunny Travel Brush Kit from Sigma can be used to apply liquid, cream and powder products to all areas of the face. With the brand's exclusive Sigmax® Fibres, the tool collection features premium filaments for softness, heat and chemical protection and anti-bacterial properties. The specially designed, patented three-ring ferrules are made from SigmaAlloy™ for ultimate strength, whilst the lightweight handles are crafted from a sustainable source of wood with eight layers of paint, making them scratch resistant. Housed in a handy container that can be turned into two brush holders for convenience, the kit allows you to achieve flawless make-up on-the-go. E.N. E30 Pencil: A tapered, pencil-shaped tip for even application. Achieve precise lines and shadows and highlight eyes. E40 Tapered Blending: Allows effortless blending so you can achieve diffused and shadowed effects. E55 Eye Shading: Features a soft, dense head and slightly rounded edges to eassily apply powder. Place eye shadow across the whole lid for even application. E65 Small Angle: The sharp, slanted tip delivers ultimate precision and glides across the upper and lower lash lines. Use with gel, cream or powder liners. 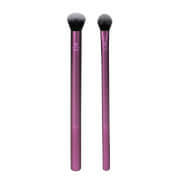 F30 Large Powder: Soft, rounded brush suitable for a diffused application of powder products. Effortlessly blends powder onto the face and body. 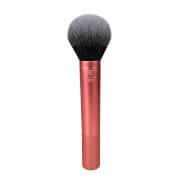 F40 Large Angled Contour: With a fluffy, angled tip for even application of blusher and bronzer, the brush reaches every curve, crease and contour for ultimate precision. F60 Foundation: Smooth foundation application. 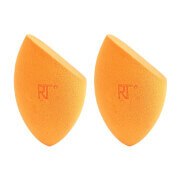 Its firm, tapered and flat head allow you to apply liquid or cream products, including foundation and primer.